I have returned from my weekend trip to LA! I bet you didn’t even know I was gone. I went to visit Mr. Pat for his birthday, and I also spent a bunch of time with a lot of other awesome folks. Sadly, there was no Suge Knight & Jeffree Star this time around. However, there was an Agent Lover! We went about remixing our wardrobes and Lunch’n. It’s not quite symmetrical yet since it’s still a little swollen, but it’ll straighten as it heals. I’ll be posting at length about it later this week. I had a blast, but I’m glad to be home. Look at us REMIXIN’. You got your septum pierced!! It looks cute on you! Was it a spur of the moment decision? I did indeed! I’ve been thinking about it for years now, but actually getting it done was sort of spur of the moment. Wow, you look great! Something seems different…like you lost weight? Whatever you’re doing, keep it up! 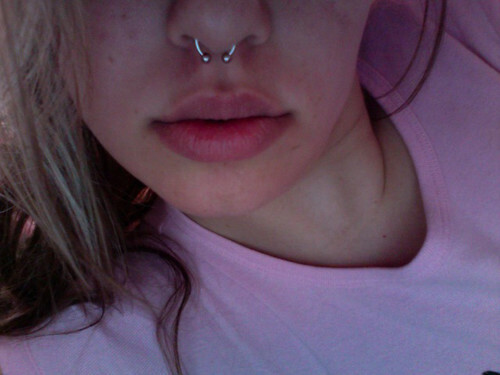 The septum totally works on you. I was always too afraid to get any piercings besides my ears! Thanks, nubs! I lost about 50 pounds over the course of last year. I probably lost about 20 since I last saw you. & thanks for the link love today! Hello 🙂 I clicked on your name at IcIng and it brought me here. I really dig that pink coat! Thanks! I found it at a garage sale for 4 bucks! Which was totally amazing because I can only imagine what it must have cost at anthropologie. You look amazing. & those LIPS! Mad luscious! And I so wish I coulda been there for the septum-piercy part. Sure miss you, L.D. Heck. I don’t know. I’ll compliment you to death. Aww thanks, dudes. You’re gonna make me blush. L.D. it was sort of last minute. Do you have a new # btw? Or are you still part of the anti-cellphone crew? aw! i miss you already! I have to agree with Gala that you have luscious lips, too! the piercing and all of the above were fun. Can’t wait to see you again. Aw, I love that piercing, and it looks great on you. that coat is Off the Hook! Thanks Tristan! Nice to see you at the office the other day! & I love you Marybee! Thanks for holding my hand!